On September 6th, Attorney General Maura Healey certified twenty-one ballot proposals as constitutional and cleared for the next step in the 2018 ballot question process. Two of those proposals; an increase to a $15 Minimum Wage and Paid Family and Medical Leave are both endorsed by Our Revolution Massachusetts. Signature Collection. 64,750 signatures from registered voters must be collected by December 6th. After this date, proposals head to the legislature. If there are not enough valid signatures approved by May of 2018, proponents have until July to collect another 10,792 signatures for inclusion on the November ballot. Valid Signatures. A stray mark, blemish or a person who signs and is not registered in a particular district, can invalidate a petition. To offset this possibility, organizers for the Raise Up initiatives will aim to collect 50,000 additional signatures. Who can forget Senator Sanders’ line, “The $7.25 dollar minimum wage is a starvation wage”? The Federal minimum wage has not been raised since 2009. Massachusetts is the sixth most unequal state in the country. The average income of the top 1% is $1.69 million while the bottom 99% earn an average of $56,115 per year. The Massachusetts Budget and Policy Center found that if the minimum wage was increased to $15 by 2021, it would raise the wages of roughly 947,000 workers or 29% of the workforce. The $15 Minimum Wage bill, (H.2365 in the House and S.1004 in the Senate) calls for the state’s minimum wage to increase by $1 each year over four years, until it reaches $15 an hour by 2021. After 2021, it will be adjusted each year to keep pace with the cost of living. It would also increase the sub-minimum wage for tipped workers (currently $3.75 an hour) over 8 years until it is equal to the regular minimum wage. 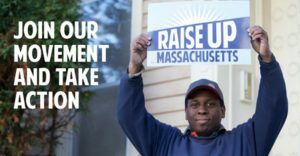 Both bills are the result of work by Raise Up Massachusetts, a coalition of grassroots organizations formed specifically to work on ballot initiatives. The coalition includes community and faith-based organizations and labor unions, including Jobs with Justice. Our Revolution spoke with Eric Bauer, one of the organizers with Jobs With Justice in Western Massachusetts, this week. When asked, “Won’t a $15 Minimum Wage hurt Massachusetts businesses?” Bauer responded, “In California, three cities passed the $15 Minimum Wage. Everyone was saying the economy would plummet, but it turned out the economy actually flourished and now the entire state has passed it.” New York passed a wage increase and Connecticut is also looking at it. “It’s imperative for Massachusetts to stay competitive in the region,” continues Bauer. The success of the campaigns will depend on effectively communicating the facts around the ballot initiatives. If the proposal and bills H.2172 and S.1048 were to pass, employees would receive a percentage of their average weekly wages to care for a seriously ill or injured family member or bond with a new child, including a foster child (family leave). The employee would be entitled to a maximum weekly benefit of either $650 or $1,000 for up to either 12 or 16 weeks and up to 26 weeks for an employee’s own serious illness or injury (medical leave). ORMA has committed to collecting a few thousand signatures for the both questions. Since $15 Minimum Wage and Paid Family and Medical Leave were cornerstone policy initiatives of the Sanders campaign, we want to activate OR members across the state and exceed our pledge. Petitions are available now through Raise Up Massachusetts organizers and at Massachusetts Teacher’s Association offices. You can join an existing signature gathering event or create your own through an OR chapter. To participating Affiliates: There is now an “Our Revolution Mass (no affiliate)” as the final choice on the drop-down list of affiliates to record your signature totals on the Raise Up website. You won’t see the drop down menu for OR affiliates until you’ve completed page one of the signature event report. Nine local ORMA affiliates (see list below) pledged to gather 4,150 signatures and we’re hoping to recruit another five ORMA affiliates to pledge an additional 2,000 signatures. Volunteers who are not in a local group but join the effort statewide could add another 1,000 signatures. If your ORMA affiliate is not on the list below, and you plan to collect signatures, please make a modest pledge (and try to over perform) The number next to the affiliate name is the number of signatures each group has pledged to obtain. Contact Rand Wilson, rand.wilson@gmail.com for how to get started.